Emergency dental services are available to all individuals that have a sudden and urgent dental need. It is not always possible to wait until a scheduled appointment in order to get the treatment you need. You may experience a trauma or suffer with severe oral pain. At times like these it is vital to have your needs attended to by a dental professional. Dental emergencies are not defined the same as medical emergencies. Although an emergency room at a hospital can take care of injuries and diseases that need immediate attention, they might not consider all dental issues as medical emergencies. In the case of dentistry, emergencies can usually be considered as loss of teeth, broken and severely chipped teeth, displaced or broken fillings, or all other problems relating to the tooth and gum areas that cause intense or inhibit normal functions such as eating or drinking. What To Do In The Event of A Dental Trauma? You can save permanent teeth that are knocked out, but you need to act fast. Hold the tooth by the crown, not the root. Rinse it gently (for a few seconds) in milk or a normal saline solution if it has debris on it. If the patient is conscious, replace the tooth in its socket, ensuring the tooth faces the right way. Hold the tooth in place with foil or by having the patient gently bite on a handkerchief. Then contact your dentist immediately. If you can not put the tooth in its socket, store it in milk or normal saline solution or wrap it in glad wrap and contact your dentist immediately. Do not vigorous scrub the tooth or use any cleaning agents. You should also never put a milk tooth in its socket as this could cause complications to the permanent teeth. Dental emergencies can happen at any time. If you experience a situation that requires immediate attention, call our surgery within our normal opening hours. In most cases, the need for emergency dentistry can be avoided by maintaining good oral hygiene. 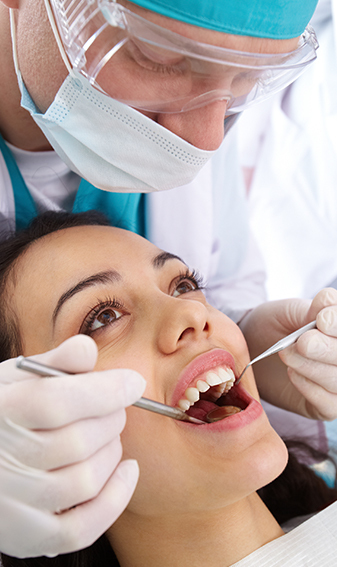 Make regularly routine visits for dental check ups. This will ensure potential problems are located and prevented from developing into severe or chronic problems. For more information contact us today on (02) 9452 5600.